The contextual property panel in Case Designer helps you to quickly configure behavior in your case type. It supports: case-wide properties, stage properties, and properties that are specific to an individual step. By default, the property panel displays case-wide properties when you open a case type in Case Designer. 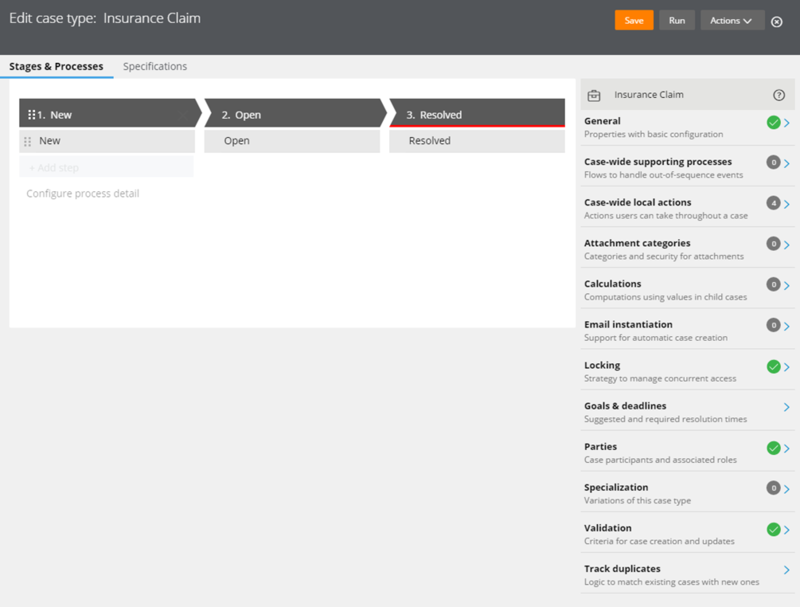 Case-wide properties are categorized based on the behavior that you can control. Click a category name to access more options. 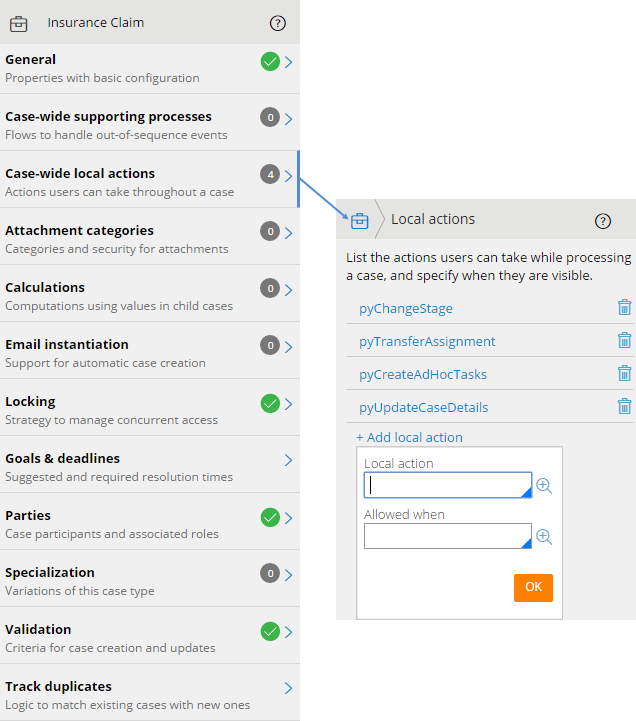 For example, click Case-wide local actions to configure the flow actions that users can run when a case is in any stage or step. When you click a stage or step in your case type, the property panel automatically displays the relevant fields and controls. 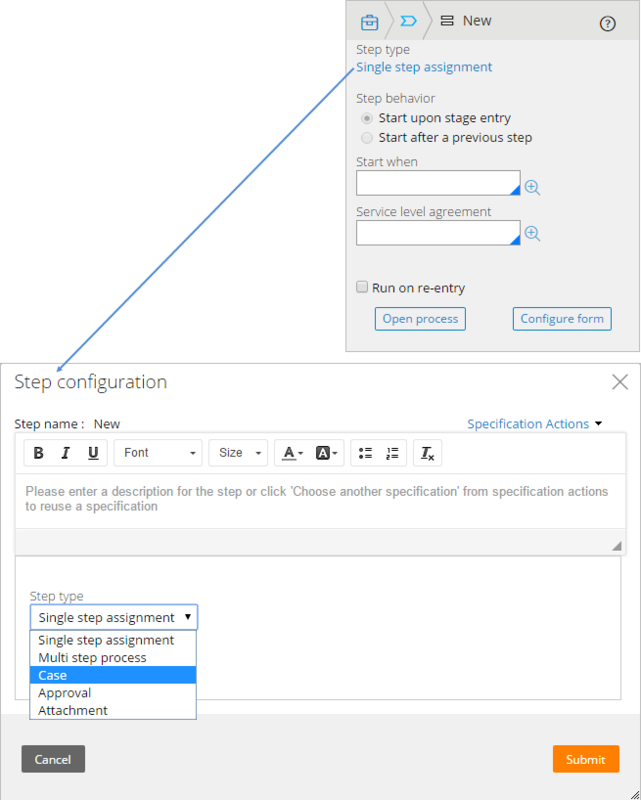 For each stage, you can add processes and local actions, set the validation logic that is evaluated before a stage is entered, and you can configure other properties, such as the transition method or service-level agreement. For each step in a stage, you can configure the step type, access Form Builder, and open the underlying flow. Click the step type to update its details. For example, you can change your step type to Case and configure your step to create child cases based on a page list that is provided. Help is integrated with the property panel to give you just-in-time information. Click ? to view a contextual help topic. Click More information to open the help system, which includes all topics, the search gadget, and a glossary. The Details tab and drop-down menus for stages and steps in Case Designer are no longer supported. They have been migrated to relevant options in the contextual property panel.